have certificate#13341 dated dec.19 1923 n/o my grandmother.Hangs on my office wall as I am stockbroker.Where can I get pics of any autos from 1923-4. Call the Sloan Museum. I think they have a Flint in their collection. Trying to reacy ZEALY...I have certificate #13343 n/o my grandfather. Would love to discuss. 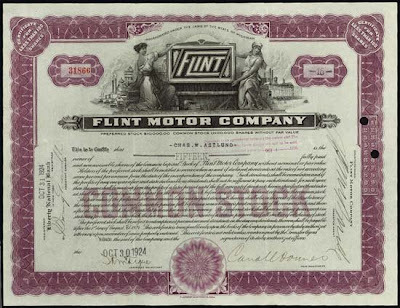 I found a flint motor company stock certificate #49750 in my fathers safe. Is it worth anything I believe it is from my great grandfather.